"Here's the dirty little secret. No one can tell the difference between a clone and a human. That's because there isn't any difference. The idea of clones being inferior is a filthy lie." 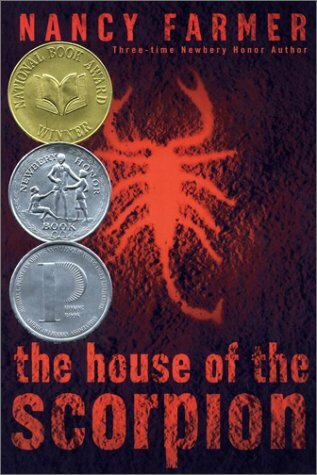 The House of the Scorpion is a 2002 novel by Nancy Farmer. It takes place in the 22nd century, where a thin strip of land between the now-impoverished United States and Aztlán (formerly Mexico) forms the country of Opium. The story's focus is on boy named Matt, who is a clone of drug lord and ruler of Opium, Matteo Alacrán, the latter of which is more commonly known as El Patron. As a young boy, he lives with Celia, his caregiver, in a little cottage in the middle of the poppy fields. Later, he moves in with El Patron, but is mistreated by the residents (save a few of the characters, such as the bodyguard Tam Lin, and El Patron) for the simple reason that he is a clone; most of clones have their self-awareness and intelligence blunted by mandated drug use. While living in El Patron's mansion, Matt gradually learns more about the history of Opium, and also the history of people he lives with. His experiences in Opium instill in him the desire to make it a better place once he becomes the new ruler. However, when circumstances lead Matt to discover that he was never meant to inherit El Patron's position, he escapes Opium with the help of Tam Lin and discovers that the world outside is no different than the one he had left behind. The book was the winner of thirteen different awards, including the Newberry Honor and the National Book Award. A film adaptation was mentioned at IMDb several years ago, but the project was never realised because the producers wished to make their own sequel and merchandise. Farmer felt this would lessen the themes of her story, so an agreement was never reached. However, Farmer has stated that she is still open towards offers for a film. The sequel is titled The Lord of Opium and was released on September 3, 2013. Eejits programmed for total control can only comply with orders they are told; if they aren't instructed to eat or drink, they simply continue carrying out their tasks into death. Matt's destiny is to act as an organ donor in order to keep El Patron alive. Aristocrats Are Evil: The Keepers hate "aristocrats" like Matt, as they feel that the goals of the collective are more important than the individual. It also applies to most of El Patron's family, and the MacGregors being portrayed as evil. El Patron's portrayal borders on this at times, but he is usually portrayed sympathetically. A World Half Full: Matt gains control of Opium in the end. He plans on restoring the land to support conventional crops and freeing the enslaved illegals within its borders. While this is a difficult task, Matt believes that with Maria, Celia and the Lost Boys, this is possible. Automaton Horses: The "safe horses" are embedded with a computer chip, that makes them follow any order given and do it until ordered to stop. They can be ridden to exhaustion and will keep going until ordered otherwise. However, they will die without food and water like a normal horse. Author Tract: The book can be read as a insight on human cloning, immigration, drugs, slavery, pollution, and stem cell research. Farmer, however, says that she is not against human cloning, but is very wary about it. Big, Screwed-Up Family: The Alacrán family has a large number of members with questionable morals. Child Prodigy: Matt is talented in a number of fields, but especially at music. One subtle hint that is given that Matt is not like El Patron is that Matt is talented with music, whereas El Patron is not. Clones Are People, Too: The lack of differentiation between clones and humans beyond law and social perception motivate the narrative. Cloning Blues: This forms the backbone of the plot, as Matt struggles to find his place in a world where law and culture are hostile towards clones. Crapsack World: The U.S.'s economy has deteriorated such that El Patron mentions that he catches illegals crossing not only into the United States, but into Aztlan as well. Meanwhile, Aztlan, seems to be under a quasi-communist government with people known as Keepers, and the only ones of who we see are extremely corrupt drug-runners who use orphans and kids as labor, feeding them with plankton - not fit for human consumption. Not much is said about the rest of the world, but a country running opium everywhere on the planet except the U.S. and Aztlan, that is protected by said countries and is unchecked by their (or anybody's) drug authorities probably isn't doing it much good. Driven to Suicide: Tam Lin knowingly drinks poisoned wine in order to atone for accidentally killing twenty schoolkids in a botched terrorist attack. Drugs Are Bad: The nation of Opium was said to be founded when powerful drug dealers made a deal with U.S. and Mexican leaders, offering to secure their borders and not traffic drugs into their country. In return, they demanded to be left alone to traffic narcotics to the rest of the world. What this system does to the rest of the world is hinted at, but never really described. Later in the novel, Ton Ton leads to the arrest of a few Keepers by accusing them of illegally taking opium products. When they object to this, Esperanza orders them to a drug test, after which they are led away by the authorities. Dysfunction Junction: The entire Alacrán family has its share of problems: to name a few, Matt is a clone and despised by the whole family. Felicia is a drunk pianist prone to nervous breakdowns, her son Tom is a bullying monster, and Mr. Alacrán, her husband, doesn't even like her. Benito is a Jerkass, and he and his wife despise each other, but they're forced to be together anyway because El Patron wants it. His wife ends up getting drunk during the wedding to cope with her husband. The only well-meaning people in the whole mess are Matt, Celia and El Viejo. Evil Old Folks: El Patron. El Patron is described as "evil" several times, and his ruthlessness shows at times, but manages to avoid this trope since at first, he is the only person besides Celia, Tam Lin, and Maria who is nice to Matt when he came to the big house, and treats him like a son, until the point where he needs his organs. El Patron is said to had to live by his wits when he was little, which is likely a contributing factor towards his nature. Fallen States of America: El Patron mentions that he catches illegals coming both ways, implying that the United States has become the equivalent of a third world country, where conditions are poor enough for people to try and immigrate into Aztlan, which, while having a decent economy, is still poor. Fate Worse than Death: Becoming an eejit is considered to be as such. Fantastic Racism: Matt is on the receiving end, being a clone. Faux Affably Evil: El Patron is one of the only people nice to Matt during his time at the Alacrán house, and maintains his grandfatherly demeanor even after it's revealed that he uses clones such as Matt to replace his failing organs. Fire-Forged Friends: Matt, Chacho, and Fidelito bond over their time spent in the Plankton Farms. Foreshadowing: The book constantly, yet subtly, does this leading all the way up until The Reveal of what clones are used for, including Matt. Freudian Excuse: El Patron's childhood. He was the only surviving child of a large family, had to beg his landlord for food, and pretty much only had money when it was given to him via charity. From Nobody to Nightmare: El Patron was born into a impoverished Mexican family, but by the time of the novel, he is one of the most powerful drug lords on the planet. Future Food Is Artificial: The Lost Boys live off of plankton; once Matt escapes from the Keepers, Sister Inez mentions that it is used only for animal feed, subverting this. Gaia's Lament: By the time the events in the novel occur, the natural environment has deteriorated significantly such that The Rio Grande's pollution is described as a "witches brew of chemicals" by Tam Lin and the Gulf of California is drained. The sequel, The Lord of Opium, expands on this: the entire world has suffered ecological devastation. Government Drug Enforcement : By law, clones must be given drugs at birth to stunt their intelligence, making them just a step above vegetables. Matt avoided this simply because of El Patron's influence. Human Resources: Clones are created simply for the purpose of extending their original's life span. Idiot Savant: Ton Ton of the Lost Boys stutters and is regarded as stupid by his peers, but has a way with machines. Immortality Immorality: They may not have been planning on immortality as such, but El Patron and MacGregor use some thoroughly immoral technologies to extend their lifespans. Istanbul (Not Constantinople): Mexico has been renamed Aztlán at some point between the time of the novel (22nd century) and the present day. Jerk with a Heart of Gold: While Chacho presents himself as tough and unsympathetic, he also cares greatly for Matt and Fidelito. Love Redeems: Implied with Tam Lin and Celia. Mr. Muffykins: Maria's dog, Furball. Modern Stasis: El Patron keeps many aspects of life in Opium in early 21st century/late 20th century stasis, right down to what Matt sees on TV. Odd Friendship: Despite their vastly different occupations, Daft Donald and Mr. Ortega are on amicable terms outside of their duties. They communicate by means of laptops to get around their respective disabilities. Parental Substitute: Celia and Tam Lin towards Matt. People Farms: Shown in the beginning of the novel, where clones are born for organs. The Promised Land: The United States, or more specifically, California, for some of the boys under the Keepers control. For many of the immigrants mentioned in the novel, the United States serves as this as well. Subverted in the fact the US's economy is so bad to the point that Americans now view Aztlán (A future Mexico) as this as well, that Opium authorities catch people coming in from both directions. Redemption Equals Death: In order to atone for his past, Tam Lin decides that his redemption is attained in death. Scatterbrained Senior: El Patron's cognitive capacities diminish towards the end of his life, leading him to make use of fetal brain implants from his clones to ward off the effects of age. Screw the Rules, I Have Money! : The reason Matt isn't brain-dead like the other clones is because El Patron has so much money and power, he can break any law he wants. As a child, Matt reads a Spanish version of The Tale of Peter Rabbit. Tam Lin asks Matt if he ever saw the movie about velociraptors, and compares Esperanza to one. Sole Survivor: Of El Patron's security staff, only Daft Donald lives after Tam Lin had saved him from the wine poisoning. Squat's in a Name: Tam Lin is named thus, probably as a Shout-Out to Tam Lin. Starting a New Life: After Matt ran away from Opium (from being killed, of course), he found himself in Aztlán. There, he made new friends and a home to sleep in. Not a good home, but better than being killed though. 20 Minutes into the Future: The novel is set the 22nd century in the sequel, but the technology in Opium has been repressed to standards used a century ago from their time, save a few exceptions such as El Patron's security system, hospital, and personal transport. The rest of the world possesses decidedly futuristic technology: holographic displays and anti-gravitational technology is fairly widespread. Walking Transplant: Most clones are created for this purpose. Ultimately, Matt learns that the same is true of him. Well-Intentioned Extremist: Tam Lin used to be one, being a Scottish terrorist who accidentally blew up a school bus in a bombing aimed at a politician. He came to Opium seeking asylum. What Measure Is a Non-Human? : This is one of the central themes in the novel. Clones are declared non-human by international law and must have their cognitive functions destroyed with drugs to justify harvesting them for organs. Matt escapes this treatment only because El Patron has enough power to break this law without consequence. This way of thinking is commonplace within their society to the extent that Maria is shocked when she is told that Matt is and always has been human. You Are Better Than You Think You Are: Despite the discrimination against clones in general, Matt comes to realise and understand that he was human all along. You Are Not Alone: Recalling that he has the support of his family and friends, Matt sets about the imposing task of reverting all of the changes El Patron had imposed upon Opium at the novel's end.